When I began to play live with my electropop duo Infernal Devices, I didn’t want the live show to be one guy behind a laptop and another guy singing. That would be pretty boring. I wanted to create a performance for the audience and an experience they would talk about with their friends. Inspired by the performance and level of production that DJs and electronic acts playing large venues, I wondered if it would be possible to do something similar in smaller venues in a way that would be portable, easy to set up, easy to repair (when it inevitably broke on the road), relatively simple to program and make changes, and yet be dynamic and expressive enough to use for throughout an entire live show. With these things in mind, I tried to plan ahead as much as possible when designing and building by sketching it out first on paper, then making a 3D model in Sketchup, and allowing room for possible changes in equipment and expansion. The box is made from wood, with the top panel covered in black speaker carpet to which musical equipment and the front LED diffuser can be easily adhered and removed with velcro and the panel is attached with hinges to allow for easy access inside to the lighting and power equipment. The latest version of the Phenomatron uses several DMX fixtures controlled via MIDI-to-DMX converter that’s fed MIDI from Ableton Live. 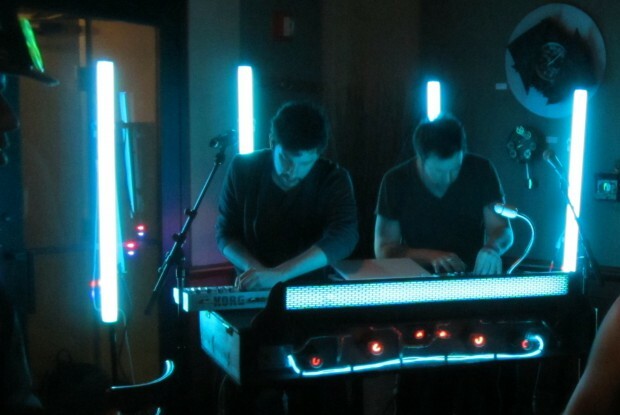 Previous versions used LEDs connected to an Arduino and controlled via serial with Processing and Ableton Live. Watch the live video for ‘Passengers’ below.